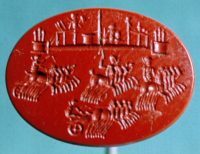 A Roman intaglio gemstone depicting a rare chariot racing scene has been discovered near Demre in the Antalya Province of southwestern Turkey. Archaeologists discovered the piece in an excavation of the ancient Greek town of Myra, one of the leading cities of the Lycian league in the 1st century B.C. Just one centimeter in diameter, the red Jasper stone is engraved with tiny detailed scenes of horse racing in a stadium. The work is of unusual high quality for the area, the epitome of craftsmanship available in Lycia when it was made 1,800 years ago. A team from Akdeniz University has been excavating Myra for nine seasons in a row. This season’s exploration of a Roman-era necropolis unearthed a number of graves with significant funerary artifacts. The gemstone, originally part of a ring, was found in one of those graves. The engraving depicts quadrigas, chariots drawn by four horses, racing in a hippodrome complete with monuments. The chariots race in the bottom half of the stone, while the top half is engraved with the architecture of the hippodrome itself. The two sections are divided by a horizontal bar representing the spina, the strip down the center of a circus which during the empire was adorned with elaborate architecture — columns, obelisks, monumental water basins or fountains, statues, lap counters, even whole temples. [Akdeniz University archaeology professor Nevzat] Çevik said the finding was an unprecedented one, with a ring depicting a horse race scene being seen for the first time in excavations at the Lycian Union site. “We have never seen such a thing before. 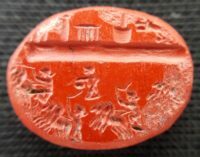 This ring stone is the culmination of a fine art. It is not just a random figure but it is the whole scene fitted in a one-centimeter stone. This is really fascinating,” he added. There is visible wear and tear around the entire oval of the gemstone that has resulted in loss of some of the details of the quadrigas and stadium architecture. The Walters Art Museum in Baltimore has a very similar piece that is just a hair larger and in impeccable condition so you can get a sense of what the Myra intaglio looked like before the wear on the edges. 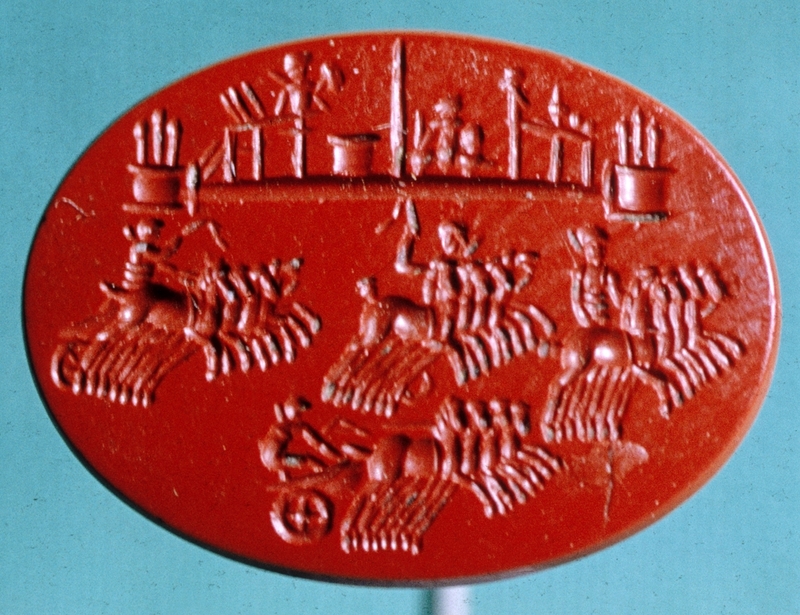 It too features a quadriga race in a hippodrome engraved on red Jasper. 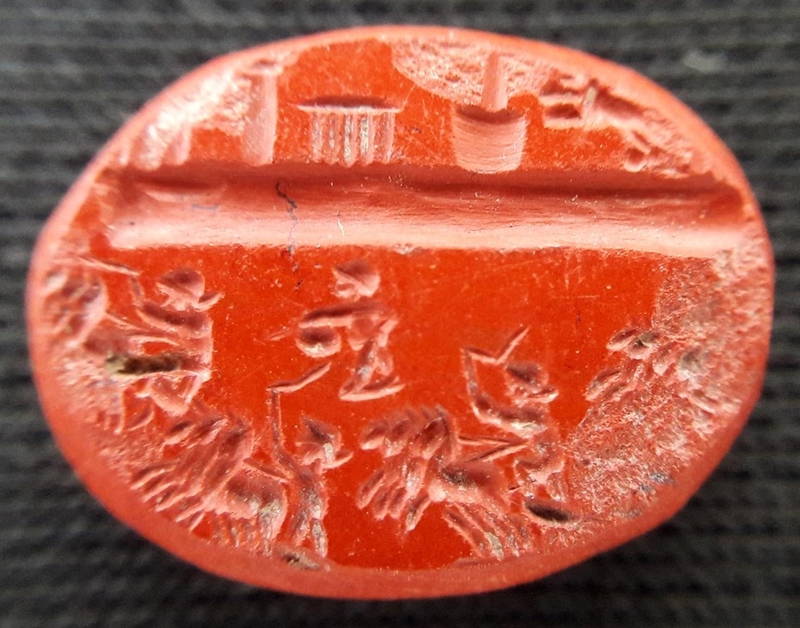 There is no find spot recorded (it was acquired in 1942 when “Roman Empire” was deemed sufficient information) but the Walters’ intaglio dates to around the same time, 2nd-4th century. This entry was posted on Tuesday, November 13th, 2018 at 11:12 PM	and is filed under Ancient. You can follow any responses to this entry through the RSS 2.0 feed. You can skip to the end and leave a response. Pinging is currently not allowed. The head of a team or a ‘company of charioteers’ is referred to as ‘factionarius’, and there also is a political aspect to this: ‘Factions’ or ‘factiones’ are still prevailling in current Italian sporting events, such as the ‘Palio of Siena’ or the rather brutal, so to speak mixed martial, ‘Calcio Fiorentino’. In the later Roman Empire, however, there were the Red, the Blue, the White and the Green faction, but according to Tertullian, there were originally just two factions, White and Red. Therefore, I wonder if there e.g. are also ‘White’ gem versions. Maybe ‘donors’ to those factions were receiving those kinds of gems. Interestingly enough, 3 of the 4 teams depicted on the gem appear to have only 3 horses. Maybe it was troika racing instead of quadriga racing. This may be artistic license. This gem seems to be executed with lesser skill than the comparison one. You may use <a href="" title=""> <abbr title=""> <acronym title=""> <b> <blockquote cite=""> <cite> <code> <del datetime=""> <em> <i> <q cite=""> <s> <strike> <strong> in your comment.